Are Brits really scoffing over 16 million1 Dairy Milks every day? The majority of us will happily welcome National Chocolate Week (10-16th October) as only 1% of Brits claim they don’t indulge in the sweet treat, a new survey by money-saving website Voucherbox.co.uk reveals. Brits’ relationship with chocolate clearly runs deep as Dairy Milk, a bar that is over 100 years old, tops the chocolate charts by some margin, with a quarter of votes. Uncovering further confessions Voucherbox also reveals 25% of the public eat chocolate every single day. The similarly solid Galaxy is the second choice, favoured by more than 1 in 10 (12%) Brits. 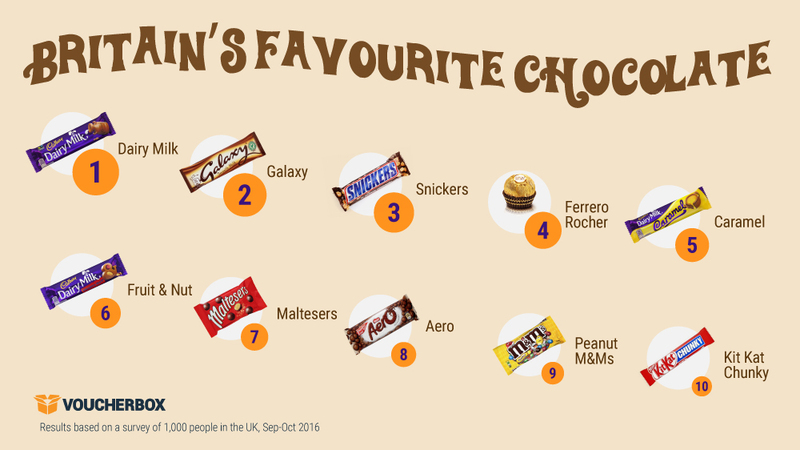 Snickers sneaks in third place, closely followed by the fancy Ferrero Rocher as Brits favour a nutty bite over biscuit giving Twix the two fingers with less than 1% of the vote. One in four people in the UK are spending approximately £219 a year2 on chocolate as they get their daily fix. Yet 41% of those surveyed have no idea how much they’re spending, and almost half the population (48%) say the cost wouldn’t sway their choice anyway. Chocolate habits may be down to the UK public seizing the opportunity to spend some alone time, with a massive 52% confessing to eating it by themselves. So much for loving someone enough to give away your last Rolo, as only 20% say they are happy to share their treat with their partner. Shane Forster, Voucherbox UK Country Manager commented, “The British consumer’s relationship with chocolate is clearly not to be messed with. Whilst National Chocolate Week may be a celebration of new creations and exotic taste sensations, it seems the British public are happiest with a chocolate bar that’s been around for over 100 years. Surround yourself with Dairy Milk delights with this great offer at Cadbury World.